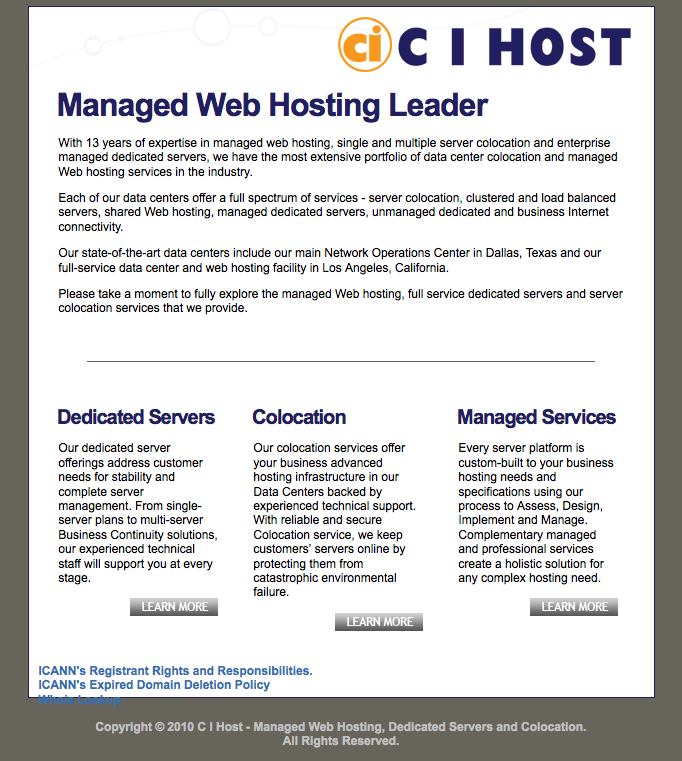 CI Hosts [ www.cihost.com / net / org ] (accredited since 4 February 2012). The termination is due to CI Host’s failure to timely cure the policy breaches by 1 March 2013 as set forth in ICANN’s notice of breach of RAA dated 11 January 2013. * C I Host’s failure to timely pay accreditation fees for several months, in violation of RAA Section 3.9 Accreditation Fees.. Prior to loss of accreditation, they transferred their own domain(s) to GoDaddy at the same time as abandoning clients domains ! However the C I Host offices now seem to be occupied by a new tennant. To protect domain name registrants, ICANN has commenced the domain name transition process and selected ICANN Accredited Domain Registrar Astutium Ltd to manage any remaining gtld domain names formerly managed by CI Host Inc.